The Complete March month Marketcalls decided to focus more on Implementing Option Strategies in Amibroker. As a kickstart thought of coding simple concepts before turning out with Complex Ideas. As a initiative, thought of starting with implementing Option Spreads with Strangle and Straddle. If you are a Options Strategic Player then probably you would be interested in monitoring the Option Spread in Realtime. However a time series option spread is even more interesting. 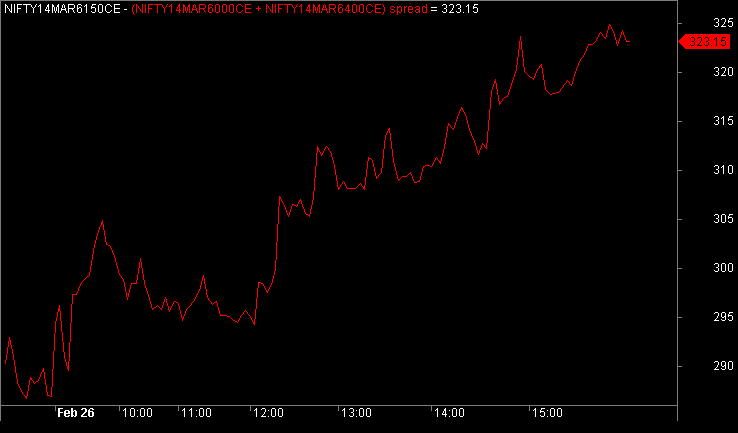 The below image shows the Option Spread of 6000CE + 6400CE long straddle strategy for march option series. 3.Now on the Left Pane goto Charts->Option Spread and drang and drop Strangle and Straddle Spread to the blank chart. Every day we are planning to release a set of Option spread strategies. Put you ideas to bring more stuff here. Stay Tuned! Yes, It is a good start. But you know these kind of option strategies also hit SL sometimes. Why do you not consider the OI change in Options considered in these type of strategies and define something accurate by more than 95% in options. Till now, we use your super trend in sell side of options.However it working great, we did observe returns in terms of % looks lesser. Any how it is a new beginning in options. Hope we can expect more from your group on this. If possible we will be ready to share our ideas as well.